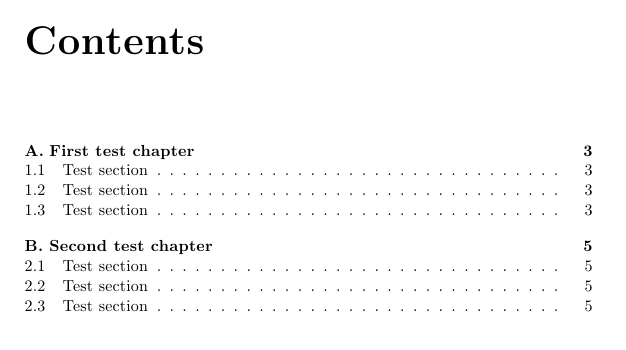 but these are not what I want really, because their directions would means to renew many commands for user-defined theorems, lemmas, exercises and problems, not to mention other default setting that \thechapter hack carries over to equations, figures and tables. and what follows are many sections in the chapter body. 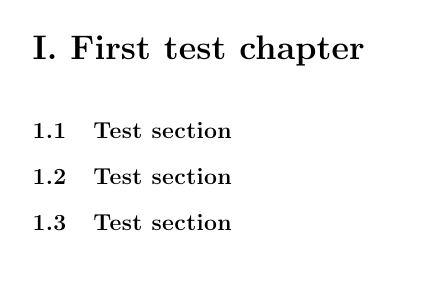 In TOC, I would like the following style. In short, all numbering styles (Romanic, alphabetic, numeral) are different. I can figure out how to tackle the heading problem by redefining command @makechapterhead but don't know how to deal those in TOC. Flipping through definition of l@chapter, numberline, etc, never hit me with how, thus needing guru helps. I can foresee solving this problem may benefit different numbering styles available for non-English languages. PS. I also know some prevailing packages may achieve this goal, but those are not what I want either. At first, I considered this numbering schema as confusing since the same object is being denoted using three different representations: Roman, Alphabetic, Arabic. However, in a comment to my answer, Jesse has explained that this is for a Chinese text in which this schema is logically sound. Not the answer you're looking for? Browse other questions tagged table-of-contents sectioning numbering or ask your own question.